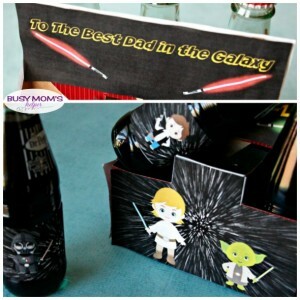 Let your Dad know he’s the ‘Best Dad in the Galaxy’ with this super fun Father’s Day Star Wars Bottle Gift Printable Set! Dark side or light? You don’t have to choose, just do one of each! This is the perfect Star Wars gift for dad, and it’s really easy to put together. You can also mix and match the bottle wraps – cool backgrounds, just characters or with some text. We just made a few changes to our Graduate Star Wars Bottle Set so it was focused on the Dad in your life, and we know he’ll love it! Download and print the sheets (links above in supplies), then cut them out. Tape into their spots on your bottle set, then gift away! Told you it was easy – yet awesome! I wish I’d made these cute Foiled Baby Footprints like Hey Let’s Make Stuff when my twins were born! You can really have fun with these Personlized Coasters from Tried & True Blog! Loving this Father’s Day Coupon Book from Jen Gallacher – it’s only $1.99 in her store! As you know, I love mason jars – so these fabulous Mason Jar Father’s Day Tags & Treats from Beth Watson Design Studio are perfect! Get our favorite crafts started, because Father’s Day will be here before you know it!